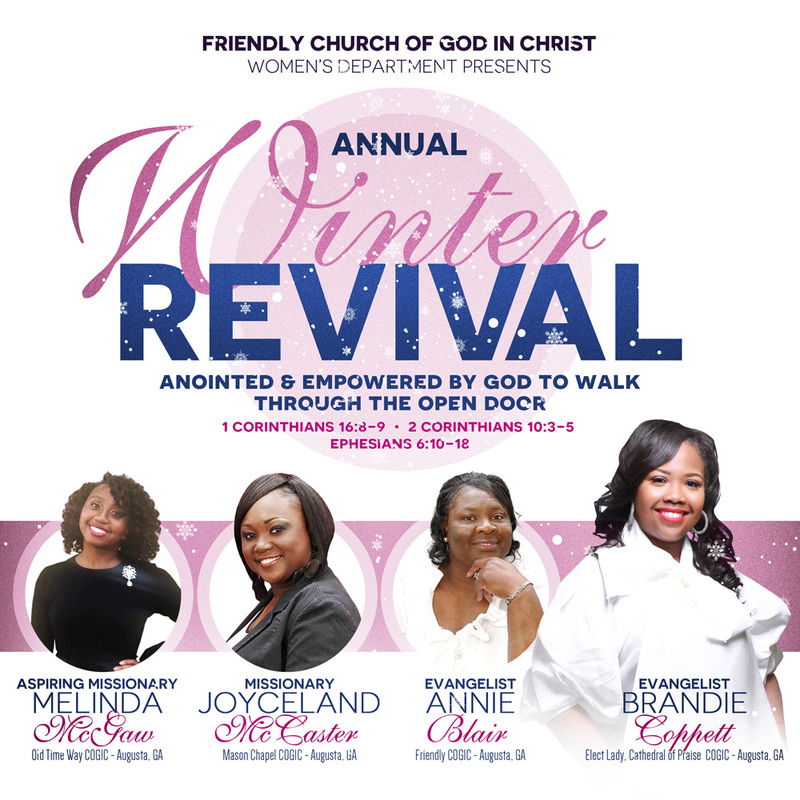 The Women’s Department Annual Winter Revival was held January 23 – 25, 2019. The theme this year was “ Anointed & Empowered by God to Walk through the Open Door”. Supporting scriptures were I Corinthians 16: 8 – 9, 2 Corinthians 10: 3 – 9, and Ephesians 6: 10 – 18. On Wednesday night, three speakers started the revival with “Tools needed to be spiritually prepared for the challenges that await us”. Missionary Annette Moore was the presider and music was rendered by the Combined Women’s Choir. Old Time Way Praise Team lead the congregation in praise and worship while Mason Chapel choir gave a sermonic solo. Aspiring Missionary Melinda McGraw of Old Time Way spoke on prayer. Missionary Joyceland McCaster of Mason Chapel spoke on God’s Word. Evangelist Missionary Annie Blair of Friendly spoke on the Holy Ghost and ended with the altar call. The atmosphere was set for revival. “It’s War Time!” from 1 Corinthians 16:8 – 9. Sister Melody Thomas was the presider. Music was rendered by the Combined Youth Choirs. Each night the sermonic solo was by the Cathedral of Praise Inspirational Team. Lady Coppett’s favorite scripture is Matthew 6:33 – “But seek you first the kingdom of God and his righteousness, and all these things shall be added to you”. Through her messages, seeking God first was put as a priority. Praising God was embraced as a tool to defeat the Devil. Man was created to praise God and as David said God inhabits the praise of his people. The congregation was encouraged and through her messages Friendly was revived. This was the way to begin a new year – in the fullness of praise.